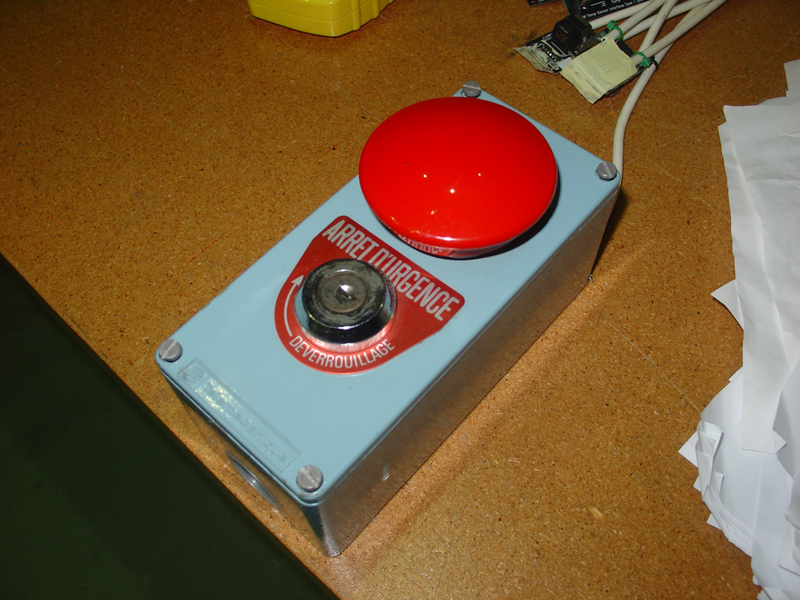 In a stunning turn of events, Large Hadron Collider (LHC) management announced a recall and review of thousands of results that came from its four main detectors, ATLAS, CMS, LHCb and ALICE, in the course of the past several years when it learned that the ignition switches used to start the LHC accelerator (see the image) might have been produced by GM. GM’s CEO, A. Ibarra, who is better known in the scientific world for the famous Davidson-Ibarra bound in leptogenesis, will be testifying on the Capitol Hill today. This new revelation will definitely add new questions to already long list of queries to be addressed by the embattled CEO. In particular, the infamous LHC disaster that happened on 10 September 2008, which cost taxpayers over 21Million dollars to fix, and has long suspected been caused by a magnet quench, might have been caused by too much paper accidentally placed on a switch by a graduate student, who was on duty that day. This is not the first time accelerators cause physicists to rethink their results and designs. For example, last year Japanese scientists had to overcome the problem of unintended acceleration of positrons at their flagship facility KEK. At this point, it is not clear how GM’s ignition switches problems would affect funding of operations at the National Ignition Facility in Livermore, CA. Posted by apetrov in Particle Physics, Physics, Science, Uncategorized. Today the 2013 Nobel Prize in Physics was awarded to François Englert (Université Libre de Bruxelles, Belgium) and Peter W. Higgs (University of Edinburgh, UK). The official citation is “for the theoretical discovery of a mechanism that contributes to our understanding of the origin of mass of subatomic particles, and which recently was confirmed through the discovery of the predicted fundamental particle, by the ATLAS and CMS experiments at CERN’s Large Hadron Collider.” What did they do almost 50 years ago that warranted their Nobel Prize today? Let’s see (for the simple analogy see my previous post from yesterday). The overriding principle of building a theory of elementary particle interactions is symmetry. A theory must be invariant under a set of space-time symmetries (such as rotations, boosts), as well as under a set of “internal” symmetries, the ones that are specified by the model builder. This set of symmetries restrict how particles interact and also puts constraints on the properties of those particles. In particular, the symmetries of the Standard Model of particle physics require that W and Z bosons (particles that mediate weak interactions) must be massless. Since we know they must be massive, a new mechanism that generates those masses (i.e. breaks the symmetry) must be put in place. Note that a theory with massive W’s and Z that are “put in theory by hand” is not consistent (renormalizable). 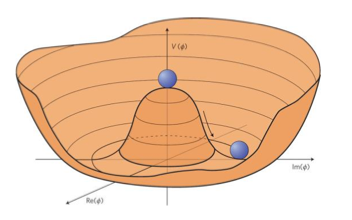 It is postulated that the theory ends up in vacuum state that “breaks” the original symmetries of the model (like the valley in the picture above). One problem with this idea was that a theorem by G. Goldstone required a presence of a massless spin-zero particle, which was not experimentally observed. It was Robert Brout, François Englert, Peter Higgs, and somewhat later (but independently), by Gerry Guralnik, C. R. Hagen, Tom Kibble who showed a loophole in a version of Goldstone theorem when it is applied to relativistic gauge theories. In the proposed mechanism massless spin-zero particle does not show up, but gets “eaten” by the massless vector bosons giving them a mass. Precisely as needed for the electroweak bosons W and Z to get their masses! A massive particle, the Higgs boson, is a consequence of this (BEH or Englert-Brout-Higgs-Guralnik-Hagen-Kibble) mechanism and represents excitation of the Higgs field about its new vacuum state. It took about 50 years to experimentally confirm the idea by finding the Higgs boson! Tracking the historic timeline, the first paper by Englert and Brout, was sent to Physical Review Letter on 26 June 1964 and published in the issue dated 31 August 1964. Higgs’ paper, received by Physical Review Letters on 31 August 1964 (on the same day Englert and Brout’s paper was published) and published in the issue dated 19 October 1964. What is interesting is that the original version of the paper by Higgs, submitted to the journal Physics Letters, was rejected (on the grounds that it did not warrant rapid publication). Higgs revised the paper and resubmitted it to Physical Review Letters, where it was published after another revision in which he actually pointed out the possibility of the spin-zero particle — the one that now carries his name. CERN’s announcement of Higgs boson discovery came 4 July 2012. Is this the last Nobel Prize for particle physics? I think not. There are still many unanswered questions — and the answers would warrant Nobel Prizes. Theory of strong interactions (which ARE responsible for masses of all luminous matter in the Universe) is not yet solved analytically, the nature of dark matter is not known, the picture of how the Universe came to have baryon asymmetry is not cleared. Is there new physics beyond what we already know? And if yes, what is it? These are very interesting questions that need answers. Since the Higgs boson’s discovery a little over a year ago at CERN I have been getting a lot of questions from my friends to explain to them “what this Higgs thing does.” So I often tried to use the crowd analogy that is ascribed to Prof. David Miller, to describe the Higgs (or Englert-Brout-Higgs-Guralnik-Hagen-Kibble) mechanism. Interestingly enough, it did not work well for most of my old school friends, majority of whom happen to pursue careers in engineering. So I thought that perhaps another analogy would be more appropriate. Here it is, please let me know what you think! If we neglect the masses of our magnets, as we assumed they are small, the mass of the picked up mess with the magnets inside is totally determined by the mass of the picked filings, which in turn is determined by the interaction strength between the magnets and the filings. This is precisely how fermion mass generation works in the Standard Model! In the Standard Model the massless fermions are coupled to the Higgs field via so-called Yukawa interactions, whose strength is parametrized by a number, the Yukawa coupling constant. For different fermion types (or flavors) the couplings would be numerically different, ranging from one to one part in a million. As a result of interaction with the Higgs field (NOT the boson!) in the form of its vacuum expectation value, all fermions acquire masses (ok, maybe not all — neutrinos could be different). And those masses would depend on the strength of the interaction of fermions with Higgs field, just like in our example with magnets and iron filings! Now imagine that we simply kicked the table! No magnets. The filings would clamp together to form lumps of filings. Each lump would have a mass, which would only depend on how strong the filings attract to each other (remember that they are slightly magnetized?). If we don’t know how strong they are magnetized, we cannot tell how massive each lamp will be, so we would have to measure their masses. This gives a good analogy of the fact that Higgs boson is an excitation of the Higgs field (the fact that was pointed out by Higgs), and why we cannot predict its mass from the first principles, but need a direct observation at the LHC! Notice that this picture (so far) does not provide direct analogy to how gauge bosons (W’s and Z bosons) receive their masses. W’s and Z are also initially massless because of the gauge (internal) symmetries required by the construction of the Standard Model. We did know their mass from earlier CERN and SLAC experiments — and even prior to those, we knew that W’s were massive from the fact that weak interactions are of the finite range. To extend our analogy, let’s clean up the mess — literally! Let’s throw a bucket of water over the table covered with those iron filings and see what happens. Streams of water would pick up iron filings and flow from the table. Assuming that that water’s mass is negligible, the total mass of those water streams (aka dirty water) would be completely determined by the mass of picked iron filings, just like masses of W’s and Z are determined by the Higgs field. This explanation seemed to work better for my engineering friends! What do you think? Posted by apetrov in Near Physics. This post is about how digital technology of the 21st century “helps” professors (well, at least, this professor) to spend his time doing very important paper submission. Except for the fact that “paper” here refers to the receipts of the expenses that were incurred attending professional conferences. Sorry in advance for the rant that follows. As an introduction, let me tell you how the procedure used to work at our University. Before going to a conference I had to “encumber” (“reserve”) expenses that I planed to incur – filling out one paper form, no receipts. After return from the conference, I would fill out the same form and attach receipts. Our secretary would then type the form up nicely and submit it for reimbursement. It would normally take weeks to get reimbursed, but timewise I’d spend only about 10-15 min doing the whole procedure. Including a nice cover letter to the said secretary summarizing the details and thanking her for her job. 15 min. Enter digital age! And the age of layoffs. With great fanfare, the university rolled out a new digital system in 2012 — no paper (save the trees! ), no secretary involvement (remember the age of layoffs? ), maybe even quick turn-around, yahoo!!! Even MIT does not have such a system! Take that, MIT! – provide proof that you paid for your hotels with your own credit card — not the university one (no problem of getting the pdf file from your credit card company, blacking out your personal details and submitting, attaching it electronically to the request). Also, you’d need to itemize your hotel stay — enter how much it was per day + taxes, etc. – you have to once again attach the same files with conference agenda. And, of course, you have to state the business purpose of all of your lunches and dinners (not to die of hunger during the conference, I suppose?) separately for each day of the conference. Of course, all of this is not a problem. It only takes 30-40 min to do all of this. If you know how. So, if my math is correct (and your expense report is not returned back — so you have to fix your problems and resubmit), the whole procedure takes about 20 min+40 min = 1 hour (60 min – remember 15 min???). Moreover, no secretary involvement, remember? I do it all myself, so the said secretary is fired. So here is some interesting math. it takes, on average, 4 times longer for me to file the digital reports. I know now why MIT does not have such a system. I’ll take that back, MIT…. Questions remain, though. Do faculty have to do all of those reports on their own time or during the time when they are supposed to do research or write grant applications or talk to students? Does the university save money on that (hint: secretary’s salary is on average less than that of a faculty)? So here you have it. Does it kill me to do all those things? Of course not. As it wouldn’t kill me to mop the floor in the corridor near my office or go to a supply store to buy chalk to teach my class. Hey, here is an idea for new cost-cutting measures! Studies of New Physics require several independent approaches. In the language of experimental physics it means several different experiments. Better yet, several accelerators that have detectors that study similar things, but produce results with different systematic and statistical uncertainties. For a number of years that was how things were: physicists searched for New Physics in high-energy experiments where new particles could be produced directly (think TeVatron or LHC experiments), or low-energy, extremely clean measurements that explored quantum effects of heavy new physics particles. In other words, New Physics could also be searched for indirectly. As a prominent example of the later approach, detectors BaBar at SLAC (USA) and Belle at KEK (Japan) studied decays of copiously produced B-mesons in hopes to find glimpses of New Physics in quantum loops. These experiments measured many Standard Model-related parameters (in particular, confirming the mechanism of CP-violation in the Standard Model) and discovered many unexpected effects (like new mesons containing charmed quarks, as well as oscillations of charm mesons). But they did not see any effects that could not be explained by the Standard Model. A way to go in this case was to significantly increase luminosity of the machine, thereby allowing for very rare processes to be observed. Two super-flavor factories (those machines are really like factories, churning out millions of B-mesons) were proposed, the Belle-II experiment at KEK and a new Super-B factory at the newly-created Cabibbo Lab in Frascatti, Italy. I have already written about the Cabibbo Lab. It appears, however, that Italian government decided today that it cannot fund the Super-B flavor factory. Tommaso Dorigo reported it in his blog this morning. Here is more hard data: there is a press release (in Italian) from the INFN that basically tells you that “economic conditions… were incompatible with the costs of the project evaluated.” Which is another way of saying that Italian government is not going to fund it. This follows by the news from the PhysicsWorld saying the same thing. Today is a big day at CERN. There are two collaborations that presented their latest results on the search of the Higgs boson. Did they finally discover the Higgs boson? Let’s first figure out what it all means? What two collaborations? What is Higgs boson? And, most importantly, what do we mean by “discovered”? First things first. The two collaborations that I’m talking about are CMS and ATLAS, two huge detectors and hundreds of professors, postdocs and graduate students working to get and work the data that come out of it. The collaborations looked at almost three years (although 2010 does not really count and 2012 is still going — but with fantastic pace) and found signals of the Higgs boson, a particle that was predicted to be there in the minimal Standard Model. Why is that we need Higgs boson and why is it there? The Standard Model of particle physics is described by its symmetries — or the symmetry group (SU(2)xU(1)) under which matter contents transform. This symmetry tells us how particles interact — and in fact, that makes Standard Model quite a constrained system. So the introduction of this symmetry is very important. However, this symmetry also tells us that all particles that are described there should be massless! What should one do? The idea is to break that symmetry, of course. The problem is how to break that symmetry. One cannot simply add symmetry-breaking terms (that would wreck the whole original setup), one has to do it indirectly. So the idea was proposed to introduce a field that interacts with all fields that are present in the Standard Model. That field also interacts with itself and forms a condensate (i.e. provides non-zero value for energy density of the vacuum) once, roughly speaking, the temperature of the Universe after the Big Bang drops below certain value. 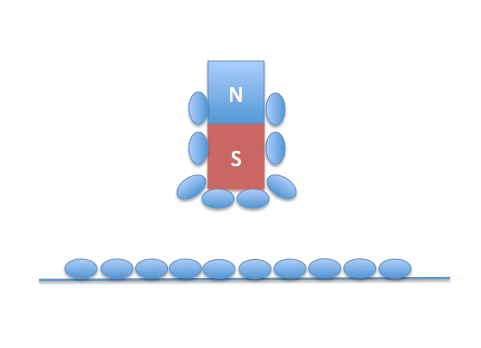 This mechanism gives mass to both electroweak gauge bosons (particles that represent weak force) and quark and leptons. The mechanism itself was first proposed in 1962 by Philip Warren Anderson. The model of spontaneous symmetry breaking was independently developed in 1964 by three groups, Robert Brout and Francois Englert; Peter Higgs; and Gerald Guralnik, C. R. Hagen, and Tom Kibble. The particle that manifests this effect is the famous Higgs boson. Read more about it here. I’ll talk more about it in my later posts. CMS went first (which is a bit unusual, as Atlas, for some alphabetical reason, would always be first to deliver their talk). The talk was delivered by Joe Incandela, a CMS spokesperson. 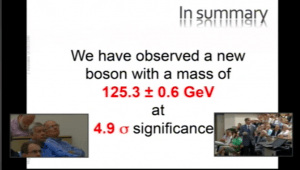 A gist of their talk is that they looked at several possible decay channels of the Higgs boson. 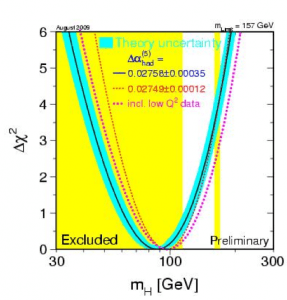 First, Higgs can decay to two photons (H → γγ). They see a significant bump at mH = 125 GeV, but only in the combination if different reconstruction techniques. The overall significance is over 4 sigma. Next, they talked about H → ZZ channel. This channel is tougher, as they need to reconstruct Z’s that decay in different decay channels. Now, if they combine their data in H → γγ and in H → ZZ they find that statistical significance for signal that the Higgs is there at 5 sigma. However, once they combine all data, especially the H → ττ channel, their combined statistical significance goes slightly down to 4.9 sigma. This is just below discovery by the standards of Physical Review Letters, a very influential physics journal. But this is in very significant. The next talk was by ATLAS. Fabiolla Gianotti, ATLAS spokesperson, gave that talk. They also see excess in H → γγ channel, but their statistical significance in that channel is lower, 4.5 sigma. Also, they include the so-called look-elsewhere effect — and then their statistical significance goes down to 3.5 sigma. Then, she discussed the H → ZZ channel. They see the excess with 3.4 sigma significance at mH about 125 GeV. Now, the combined results have excess at mH = 126.5 GeV with (local) statistical significance of 5.0 sigma. This is a discovery. In passing, ATLAS also see a bump in their 4-lepton channel at approximately 90 GeV. Still not clear what it is…. This discovery is very significant. It tells us that our ideas on how electroweak symmetry is broken are at least partially correct. This is also the first truly elementary particle discovered since the Z-boson. 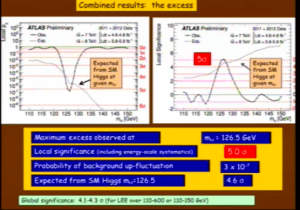 There are still many questions, both experimental and theoretical, about the analyses presented today at CERN. What is going on with the H → ττ channel? Is it really a Standard Model Higgs boson? Or some other scalar particle. We’ll sure to study those things indeed. P.S. The theorists who described the effects were there and not only were acknowledged by the experimental speakers, but also got to say a couple of words at the end. Here is what I said in that post of mine from several years ago: “What is interesting about this ad is the equations that this lady is writing — they look like the equations from the famous Peskin and Schroeder’s book on Quantum Field Theory (QFT), equations describing renormalization of phi^4 theory! How did Ford get a hold of them? As it turns out, I happen know the answer. This ad was made by a company that is headquartered in Detroit — I have a business card of one of the authors of this ad! The reason I re-post part of that old post is the following. I recently went to Florida to participate in CIPANP-2012 conference (I’ll post my impressions of this conference later this week). Now, Kennedy Space Center is on Cape Canaveral in Florida, so I rented a car and went to visit that marvelous place. The place is truly amazing! Lots of things to see. The place is still making history: I visited it just a couple of days after the historic launch of the Space X‘s Dragon capsule. See how many mistakes they got in there? 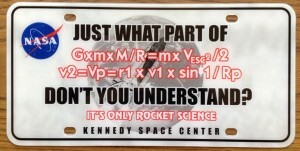 And it’s not “rocket science”, it’s freshman physics! Quite embarrassing… Clearly, people from that JWT advertising agency in the example above take their job responsibilities much more seriously. See that NASA seal in the upper left corner? Since I am sure that NASA scientists know physics, I take it as indication that they never visit their gift shop. I’m blogging from the site of CHARM-2012 conference, which has just started in Honolulu, Hawaii. This is a fantastic conference at a fantastic place! The conference will have four full-packed days filled with many aspects of physics related to charmed quark. As I reported earlier, many exciting recent results are associated with charm quark. Why is the conference taking part in Hawaii? Besides being a nice place in general, it is almost exactly half way between Japan and the US. This meeting alternates between Asian, US and European locations, and last meeting, in 2009, was in Beijing — so it is US’ turn. There will be many talks from KEK‘s Belle collaboration (which University of Hawaii is a member of), LHC experiments, as well as from Tevatron experiments. Besides, world’s only operating charm experiment (BES 3) is located in Beijing, China. Indeed, there would be many theory talks as well. It shapes to be a very nice conference — and I’ll be reporting about exciting results to be discussed here. Posted by apetrov in Funny, Near Physics, Physics, Science, Uncategorized. One of the most significant advances of science in the 21st century so far is the 2008 discovery of iron-based high temperature superconductors such as LaFeAsO1-xFx. Previously, all high-temperature superconducting compounds, there so-called cuprates, were based on copper and consisted of copper oxide layers sandwiched between other substances. Much of the interest in those materials has arisen because the new compounds are very different from the cuprates and may help lead to a theory that is different from the conventional BCS theory of superconductivity, where electrons pair up in such a way that so coupled they can then move without resistance through the atomic lattice. Among those new materials is the iron telluride, FeTe. This compound has the simplest crystal structure and exhibits antiferromagnetic ordering around 70 K and does not show superconductivity. 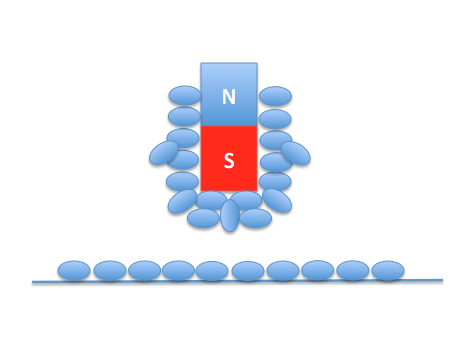 It is now known that substitution of S for Te sites suppresses the antiferromagnetic order and induces superconductivity. Quite amazingly, this is not the most surprising property of those compounds. In a quite remarkable study performed by a group of Japanese physicists, it was shown that the iron-based compound FeTe0.8S0.2 exhibit superconductivity if soaked in red wine. They also performed a study of the effect with different types of wine and other alcoholic beverages, finding that a particular type of wine, 2009 Beajoulais from the French winery of Paul Beaudet, has the most profound effect. A recent follow-up analysis, however, showed that subsequent and repeated applications of red wine and hard alcoholic beverages, such as cognac or vodka, can induce a new state in the study samples, dubbed the inverse superconductivity. The results, reported in the recent issue of Wine Spectator, clearly show steep increase of the samples’ resistivity after only five consequent applications of the liquid substance. As explained by the lead author of the study, John Piannicca, the results follow the simple model of the electron crowd. Interestingly enough, as reported by Dr. Piannicca, this model was developed by observing the change in the mean free path of a group of students visiting bars near the campus of his University. Moreover, as was shown in a recent work of a group of scientists at the Siberian institute of Advanced Kevlar Engineering, it is also the quantity of alcohol that was responsible for the onset of inverse superconductivity. While this is also consistent with the already mentioned model of electron crowd, the samples obtained in the Siberian lab required much larger quantities of alcohol to achieve the same effect than those obtained in the American or Japanese labs, which could probably be explained by the specifics of liquid utilization. As was shown, the best effect was achieved with a brand of vodka “Imperia” commonly “recognized for it superbly smooth spirit and pure taste,” as advocated by its producers. It would be interesting to see how other brands would fare in such a study, which is on-going. In a couple of Hours we shall know more than we did before — the CERN experiments, ATLAS and CMS are about to announce their findings about the Higgs boson. In particular, its mass. Why is it interesting? The mass of Higgs, a fundamental particle in the Standard Model (SM) and a manifestation of a Higgs mechanism (discovered by at least five people besides Dr. Peter Higgs), cannot be predicted within the Standard Model. Similarly to masses of quarks and leptons, it comes out from the combination of unknown parameters of the SM. Yet, Higgs boson would affect precision measurements — its effects could be seen via its quantum effects. So physicists would come out with pictures like the one that accompany this post (from which, incidentally, one can learn that the most likely value of the the Higgs mass given by the minimum of that plot, is already excluded by the direct measurements; what can one say — it’s a tough game). Meanwhile, let’s see what CERN physicists have to say. Tune in here and let’s hope that we don’t overwhelm CERN’s servers.